We’d love your help. Let us know what’s wrong with this preview of Once Was Lost by Sara Zarr. To ask other readers questions about Once Was Lost, please sign up. there are many books that i want on a budget, is this one worth the money or should i try a different one? So was Sam's dad having a sexual relationship with the youth group leader? Anna Yeah, I'm also a little sad that there was no confrontation or revelation as to what was really going on, too. The more I read by Sara Zarr, the more I think I understand her and the more I begin to appreciate what it is she does. She doesn't take sides, she isn't emotionally manipulative, she releases a whole bunch of complex characters that aren't typically likeable and allows the reader to receive them however they choose. I think this is why I failed to appreciate Story of a Girl, because the issues targeted in it are very important to me and I wanted the author to fight for Deanna, to stand up for her - and that's just not Sara Zarr's style. I get that now. Once Was Lost, on the other hand, is an absolutely perfect novel to use this technique in. I am an atheist, but I cannot stand anyone who preaches their religious views in novels, whatever they may be and regardless of whether or not they agree with my own beliefs, I don't wish to have any idea rammed down my throat. Sara Zarr is the reason I was able to stomach a book that has a very heavy focus on religion, because she never attempts to put ideas in my head. In my review of Story of a Girl I remember commenting that I wished I knew where the author stood on the problems in the book because it wasn't obvious. And again with this novel, I do not know where Sara Zarr stands when it comes to religion, but this time I feel the novel is better for it. The novel becomes about the characters and their emotions and suffering and recovering, it is not a book about whether or not God exists. The religious aspect is an important part of showing how Sam loses her grip on her perfect life and what she'd previously believed in. The main questions are: will Sam recover what she has lost, not just her religion but her life, family and happiness? How will she do this? Will she ever become the person she once was? Though I don't think this was as strong a novel as How to Save a Life, it has cemented my love for Sara Zarr and I can't wait to see what she writes next. Once Was Lost is a book about faith. About losing it and finding it. Yes, I know how it sounds. Nothing can stop me from reading a book quicker than knowledge that I am about to delve into some "Christian fiction." I am not a religious person and dislike being preached at. But in this novel Samara's waning faith in God is similar to a non-religious person's belief in the good in the world. Sam feels hopeless. Everything seems to fall apart - her house, her family (Sam's pastor father is distant an Once Was Lost is a book about faith. About losing it and finding it. But in this novel Samara's waning faith in God is similar to a non-religious person's belief in the good in the world. Sam feels hopeless. Everything seems to fall apart - her house, her family (Sam's pastor father is distant and neglectful, her mother is in a rehab and unapproachable), her friendships. The final straw is the disappearance of a 13-year old neighbor which forces Sam to lose faith in all the people around her. Is there anything solid in this world? Anything at all good? Anything worth holding on to? Anyone she could trust? Sam is lost and doesn't think that there is a point in it all, that there is anything worth believing in. I have read 5 books from Sara Zarr (including this one) and I can say that this book is my least favorite. Not that it wasn't good. It was good. I bet some people will like it more than I do. (Actually, some Goodreads people liked it more than I do haha). It's just that I didn't get attached whole-heartedly with the main character, who is Samara. And sometimes, I did feel I can't connect with the story either. I mean, one moment I understand what is happening and the next moment, I don't. But even though with what I've mentioned above, I did feel the emotions within this book and its characters: the pure sadness, worry, anger, suffering and recovering, that really moved me in one way or another. Besides, these flawed and complex characters made the story engaging to read. I seldom read books about faith and religion, simply because, as what you could consider a non-believer, they are rarely something I can relate to. In this case, I have to say, Sara Zarr really succeeded in creating a very relatable heroine, not only for people who can identify themselves with her faith, but also for everyone else. This book does not preach, and although Samara's situation is closely linked to her disappearing faith in God, her doubt and uncertainty are universal. They are nothing only a person of faith experiences, but rather something anyone has to deal with sometimes. Now and then, I was thrown off by the biblical references (Sam comparing her situation to stories in the bible), but mostly because that is something I am unfamiliar with (and also something I would never do). But I think for her as a pastor’s daughter, this was a part of her everyday life, something she grew up with. This story is a quiet one, unravelling slowly, without much "action" or drama. But it is also a story that lingers, with a message I thought about and characters that became very dear to me. The first half of the book was slower for me, the sadness and desperation sometimes hard to take, making my stomach hurt from the pain Sam experienced. The second half was a much quicker read, with shimmers of hope shining through every now and then, making me hope for a change for the better. I am amazed at how much feeling Sara Zarr succeeded in packing in such a small book. Recommended if you are looking for a different, quieter YA contemporary. I will definitely read more by this author. While I can now say unequivocally that I am a committed Sara Zarr fan, this one is probably my least favorite of hers. Like her other novels, it’s well written and replete with honest, bare emotion, but for some reason I didn’t connect with this one completely. For me, her books belong in two categories: there’s the more bristly, damaged, and difficult category for Story of a Girl and Sweethearts, and then there’s the melancholy but hopeful category for How to Save a Life and this book. Me being me, I prefer the horribly difficult category. But I strongly suspect that this novel and her latest will be the most popular among readers. So, if you are one of those folks who didn’t quite like Story of a Girl because it seemed too depressing, then I would give this one a try. Sam is a teenage girl isolated by her status as the Pastor’s daughter. She lives behind an image of the good girl, the devout Christian, the perfect daughter in the perfect family. But in reality, her mom is in court-suggested rehab and her dad, the perfect young and hip Pastor, doesn’t have time to notice that she’s alive. Even her friends keep her at an arm’s length. When a terrible tragedy occurs, the people of her small town are shaken, and Sam begins to question her own faith. This is a book about faith, but not just simple religious faith. It’s about faith in the people around you, in your family. It’s about that childhood realization that parents are just extremely flawed people like everyone else, and they will make horrible mistakes. I kept going back to the title of this book while reading it, to the lyrics of Amazing Grace: “I once was lost, but now I’m found, was blind but now I see.” Reading this book makes me consider those words in a new light, because as much as this book is about regaining what once was lost, it’s also about having your eyes opened. Sometimes that’s empowering, and sometimes that means losing something that can’t ever be regained. I think that this book is also about repression and denial. Sam keeps everything – her anger, grief, jealousy, and doubt – bottled up inside. And it’s clear that she’s learned this behavior from her mom, the perfect housewife who drinks to get through the days and from her dad, the perfect Pastor whose life is actually falling apart. It seems like by the end of this book, nothing has really changed for Sam in that respect (although I did see growth in both of her parents). She never does tell her mother or her father or anyone how she really feels. And I think that would have been completely realistic (and yet another example of the ambiguous endings that I’ve grown to know and love from Sara Zarr), but the ending itself just feels too…resolved. In my mind, Sam was heading down a path of depression and a possible addiction of her own someday if she didn’t learn to open up to someone. But the ending seems to be telling me that everything’s going to be alright, and that just doesn’t add up for me. I guess I was looking for more catharsis, with an ending that neat. Maybe I feel like happiness demands a price. Ah, it’s been a nice run of Sara Zarr and Mumford & Sons, hasn't it? Now I just have to wait for her to write another book. While the religious premise may make some mainstream readers hesitant, it is so honestly portrayed that it's not about religion at all, rather one girl coming to terms with faith, hopelessness, searching for the truth and trying to find her place in the world: not issues unique to Christians, rath Author Sara Zarr goes from strength to strength with her writing. Story of a Girl and Sweethearts are both beautifully told quiet and courageous stories but I think Once Was Lost is my favourite so far. The only other book I have read by your magical self is Sweethearts. Maybe I need to read it again, because I don't remember liking it that well and we are clearly MEANT TO BE. But, unfortunately, I can't put my feelings about this book into words very well right now. Maybe ever. I'll try I am in love with this book. 1. Sara Zarr is a poet. I notice this especially after reading The Maze Runner, which, while not badly written, was clearly not written by a poet. Sara dwells on her words with love. The descriptions and inner monologue are rich and multi-faceted, while the dialogue is realistic and glorious to read. So many of these characters were truly hilarious. And, in many cases, cuddle-worthy. 2. The romance killed me. Oh my dear goodness. For a long while I was not really paying much attention to the relationship between Sam and Nick, happy with the two of them being friends and sharing their unique pains. Um well so. By the end I was like WOULD THE TWO OF YOU PLEASE JUST GET MARRIED AND BE HAPPY FOREVER??? 3. More importantly than any of that (although the above two factors have made me a Once Was Lost fan TILL KINGDOM COME), was the simple fact that Sam's story hit me. Hi guys, just the local Christian going to a Christian college here, letting you know that Sam's faith/doubt issues are pretty much the most amazing thing ever. I want her to be my best friend, and I will punch Erin in the face for her (which is a weird thing to type, my name being what it is), and I... dah, I don't know. As soon as I finished the last page, I started daydreaming about the fine day when I will officially own this book. And read it until the binding falls apart. That is what it deserves. Read it read it read it read it. "I want to believe the stories, that there really is someone who would search the whole mountainside just to find that one thing that he loves, and bring it home." I am at a total loss as what to rate this book. But one thing I can say for sure is that it gave me a lot to mull over and analyze, that I even thought about how I felt at the age of 15 again. At Samara's age I can remember being very contemplative like she was in the story. She feels the urge to mature and to fully grasp the understan "I want to believe the stories, that there really is someone who would search the whole mountainside just to find that one thing that he loves, and bring it home." At Samara's age I can remember being very contemplative like she was in the story. She feels the urge to mature and to fully grasp the understanding of the things she always relied on, but is struggling so much because of what is happening around her. Her father is the pastor of a local church in Pineview, and her mother is in rehab. There is the whole thing about being the pastor's kid, and how she is treated differently because of it. Things are going on as "normally" possible, but something happens that shakes the whole town. Jody, a local girl from the chruch, is kidnapped. This book tackles the sensitive issue of religion, and Zarr did this with ease. When talking about religion in books it can come off preachy, and you can just imagine eyes rolling. You see actual substance, and you never feel this is an anti-religion book though some people may see it that way because of the doubt that Sam harbors. It touches a lot of subjects without being heavy handed. The feelings that Sam has really come through to you, and though I was close to being annoyed at her she would do something redeeming. Sam is fairly mature and I appreciated that she could see why her father, mother or anybody for that matter would do certain things, but she never excused them for it. With Jody being taken away you see how the paranoia can get to people. The whole town sees everybody in a different light, and I had to keep guessing who did it, though this isn't necessarily the book's focus. It's real focus is how this event affects everyone in the town and specifically Sam. What can be admired about the author is how she can write scenes that hold lots of hidden meaning without much being actually said. Sometimes what is not said speaks louder than what is. Once Was Lost by Sara Zarr is set in the small town of Pineview. Samara Taylor is fifteen and lives with her father, Charlie, the town’s pastor. She remembers a happier time last summer, spending time with her parents but now her mother is in rehab and Samara feels like everything in her life is breaking or already broken. Her father is ignoring the problems they’re facing, like her mother being in rehab and the fact that they rely on the town to pay their bills, and while he’s good at being the Once Was Lost by Sara Zarr is set in the small town of Pineview. Samara Taylor is fifteen and lives with her father, Charlie, the town’s pastor. She remembers a happier time last summer, spending time with her parents but now her mother is in rehab and Samara feels like everything in her life is breaking or already broken. Her father is ignoring the problems they’re facing, like her mother being in rehab and the fact that they rely on the town to pay their bills, and while he’s good at being there for his congregation, he’s not good at listening to his daughter. Sara is a master at writing opening pages, I immediately felt the heat and hopelessness of Samara’s life. Samara’s mum is an alcoholic and has been in a local recovery centre for two weeks, after she crashed her car while drunk. Before that Samara can remember a time when her mother still functioned but over the last year or so, Samara increasingly had to cover for her mother, explaining why she couldn’t attend an event or why she’d forgotten to do something. She understood the pressure her mother felt to keep up appearances as the pastor’s wife but it was a lot of responsibility to put on a fifteen year old. While dealing with her mum, Samara is also coming to terms with the fact that she has lost her faith. She can remember believing when she was younger but lately she finds herself doubting her belief and questioning the idea that your church community is always there for you, does that include when your mother is in rehab? Do people actually care when they ask how you are? She still attends Youth Group with some kids from her school, including her best friends, but she’s always felt like an outsider because they only see her as the pastor’s daughter and they assume she’ll tell on them if they do anything they’re not supposed to. Then a girl from their community, Jo, goes missing and her father is once again spending more time with others rather than dealing with his own life. Nick, Jo’s older brother, is a member of Samara’s Youth Group. The two of them aren’t really friends but his sister’s disappearance throws the two of them together and Samara enjoys having someone to talk with honestly. I really felt for Samara, she’s trapped in a situation created by her parents and she doesn’t have anyone to talk to, apart from Nick. Her Youth Group leader, Erin, wants to help her but Samara is suspicious of her relationship with her dad, another thing Samara has to worry about. I didn’t like her dad very much, he let his work get in the way of caring for his daughter and at the same time he was really controlling: Samara isn’t allowed to use the internet and has never even held hands with a boy, so of course her dad reacts negatively to the news that Samara and Nick are becoming friends. Samara broke my heart when she asked Nick if a boy would ever see her as a real girl, I can’t imagine feeling like I wasn't real and wondering if anyone is going to like me for me. My only qualm with her was her need to make up answers instead of being honest about her feelings so as not to make people uncomfortable, but I don’t blame her, I blame her community for that because she feels like she must have everything together, all the time. I don’t usually read novels revolving around religion, but Once Was Lost has a lot more going for it, so don’t let that put you off. Sara has a way of writing so honestly, and to me, the bigger issues were family, growing up, taking responsibility and love. I am a big fan of Sara Zarr’s work (see: Story of a Girl and How To Save a Life), particularly the quiet emotion that permeates her strong, character-driven stories. Once Was Lost is no exception. For a novel that deals with questions of faith, Zarr approaches the subject matter with accessibility and lack of agenda. Sam’s struggle with belief is relatable because it’s anchored in very human emotion and circumstances: while a small community is shaken by the disappearance of a young girl, Sam’s I am a big fan of Sara Zarr’s work (see: Story of a Girl and How To Save a Life), particularly the quiet emotion that permeates her strong, character-driven stories. For a novel that deals with questions of faith, Zarr approaches the subject matter with accessibility and lack of agenda. Sam’s struggle with belief is relatable because it’s anchored in very human emotion and circumstances: while a small community is shaken by the disappearance of a young girl, Sam’s own family is grappling by her mother’s alcoholism and her father’s increasing distance, absorbed into his work as Pastor. Sam also doesn’t quite see herself as belonging; she’s “Pastor Charlie’s daughter” the one who doesn’t get invited to parties, the one everyone is “good” around. With with her mother’s DUI and subsequent admission to rehab, Sam becomes even more alienated from her peers, unable to confide in them and disclose the true nature of her mother’s absence. Sam struggles to reconcile the concept of a loving God with the widening spaces within her family and the devastation wrought by Jody Shaw’s disappearance. As the community draws together for support and comfort, Sam finds her grasp on her faith slipping. Questioning what was once a constant in her life causes a hopelessness to settle into Sam’s thoughts; without the anchor of belief in God, how does she interpret and navigate the world around her? Once Was Lost addresses the question, from Sam’s perspective, of whether doubt and belief can coexist in her world. It’s handled in a subtle, tactful, manner – this undoubtedly a book about faith and religion, but there are themes here that will resonate with a wider audience than those who subscribe to a belief system similar to Sam’s. The relationships in the novel, between family and between friends, are particularly well drawn and nuanced. Sam’s growing isolation, exacerbated by her father’s preoccupation with his congregation, echoes the sense of alienation often experienced in adolescence: Sam isn’t quite sure where she fits in, if she is the person she had always thought herself to be. Then there’s the emotional impact of Sam’s mother being in rehab, and what this means after years of glossing over her alcoholism, and her father’s apparent inability to see his daughter’s emotional struggle. As with Zarr’s other novels, there are no absolutes and not necessarily all the answers. Her characters experience, feel, live with palpable emotion; but they don’t necessarily behave or make the choices the reader would expect. I love that Zarr has enough respect and faith in her characters to write them this way, allowing them to be thorny and complicated, while keeping them close to the reader, making their conflicts real and relatable. Once Was Lost is a quiet, moving novel – rich with authenticity and meaning – that addresses a complex issue in an approachable and balanced manner. And maybe one day I will get around to reviewing Sweethearts.. I have a weakness for books with intelligent discussions of religion, especially books like Once Was Lost with accurate portrayals of doubt. They speak to my life experience, especially since losing my grandfather 2 years ago. At times, faith is a struggle. Faith is a central theme without the book feeling overly religious or anti-religious. As a pastor's kid, Sam's family is supposed to be perfect. Her father is the young hip pastor of the only growing church in her small town. Her mother is a f I have a weakness for books with intelligent discussions of religion, especially books like Once Was Lost with accurate portrayals of doubt. They speak to my life experience, especially since losing my grandfather 2 years ago. At times, faith is a struggle. Faith is a central theme without the book feeling overly religious or anti-religious. As a pastor's kid, Sam's family is supposed to be perfect. Her father is the young hip pastor of the only growing church in her small town. Her mother is a functioning alcoholic, except she's not functioning very well anymore. When her mom crashes the car and is sent to rehab, that leaves Sam and her father. Only her father's so busy being a pastor he's not around very much to be a father. So most of the time it's just Sam. When Jody Shaw, a young girl from Sam's youth group, goes missing the doubts that are piling up begin overwhelming Sam. She struggles with the big questions and since her father is so busy helping Jody's family and her mother's in rehab, Sam is left to deal with her faith on her own. The way this story handles faith struggles is realistic and intelligent. Sam has doubts and questions but feels guilty for having doubts and questions. Because of her family, she doesn't really feel like she's allowed to ask those questions. It's very internalized. You can feel the aching loneliness of lost faith and longing for a miracle so vividly in this novel. In this book lost does not have just one meaning. It's about a girl literally lost, missing presumed kidnapped that everybody's looking for. But it's mainly about Sam, lost without anyone noticing. It's also about her mother, lost in the alcohol and away at rehab. There are many kinds of "lost" in the world and the book does a good job exploring the theme. I recommend this on audiobook. I'm normally wary of author-narrated books but Sara Zarr does an excellent job. Sam has her world just breaking all around her and she has just shut down from everyone and everything. She doubts things that she had always believed and questions go whirling around when a girl disappears from her church. I know that maybe some people might not like her expressing her doubts but it really didn't bother me all that much. Sam conveys that her life is bad without sounding whiny, a definite plus. And even though she is down for much of the book I never felt hopeless, just more somber. What made me want to give it 4 stars was the father. I HATE him. Even after a week since reading the book I still resent him. He's a horrible father and a selfish son-of-a...dog. Sam was mature enough to accept him for being human and making mistakes even though she doesn't excuse him for not being there when she needed it. And she also does the same for her mother. I doubt I'd be so mature. But that is what I really liked about the book. I could really see everyone as a real person and I therefore could feel the unfairness of everything and really feel angry; with the blood rushing, my hands clinched, and the desire the throw the book across the room because I needed to hit something in my frustration. And I could feel very sad too. Another reason I could appreciate the book so much was I could really get the symbolism of things that I could usually only get if I had a teacher explained them to me. I could see the symbolism in the weather, the broken stuff in the house, the yard and so many other things. I liked it that I could recognize them without having to read into every little thing. There is so much truth in Zarr's story, almost every character says some true at one point of another. The ending was good. I still hate the father but maybe I could learn to accept it -this is a big MAYBE. Last night I started (and stayed up way too late to finish) Sara Zarr's Once Was Lost, which was just wonderful. Still too close to it to do much beyond a bit of raving, but it's at least somewhat quote-enriched raving. Sam is the fifteen-year old daughter of a pastor in the small - really small - town of Pineview, where everyone knows pretty much everyone, and those in the congregation especially know the business of the pastor and his family. Except for the bit about her mother's having been sent to rehab after getting in an accident while DUI. Sam's father keeps promising he'll tell the congregation, and then Sam will finally be able to stop covering up and hiding. But Sam's dad is a lot better at always knowing the right thing to say, and taking the time to say it, to his congregation than he is to his own family. Or than he is with the congregation in this one case. And with her mother in rehab, Sam is lost and depressed already, when she hears the news that a girl from the town - from the congregation, in fact - has been abducted. Sam has to try to cope with the shock and fear and grief without help from her mother, her father or God, all of whom seem to have left her in one way or another. Mom always says that doubt is just another way of expressing faith, and sometimes I'd hear her mutter things to God, like, "Thanks a lot. I guess we'll chalk that one up to character development," or, "I eagerly await your explanation for this in the hereafter, assuming there is such a thing." The picture we get through Sam's narrative of her mother's rather sudden slide from drinking way too much to keep herself together in the face of the constant scrutiny and having to live up to her position as pastor's wife, into drinking way, way too much and no longer managing to keep it together is both credible and infinitely sad. It's a neat trick to develop sympathy for a character only seen for much of the book through the memories of another character for whom the reader feels primary sympathy, and Zarr manages admirably. Sam's narrative is occasionally an extremely difficult position to inhabit, as for example when she fails repeatedly to respond to her best friend's desire for her to share her feelings about her mother's being in rehab, about the abduction, about having been sent to live with her friend's family. Completely understandable given what we know about Sam - and some of it pretty classic child of an alcoholic behaviour - but still worrying, when we feel Sam's vulnerability and isolation already, and fear she may cut herself off the few friends she does have. All this is powerful stuff, and there's a central part of the plot that concerns the girl who's been abducted, the search for her, the impact on her family and the people in the town in general, and the information filtering through that the chances of finding her alive drop dramatically after the first 48 hours. Even though I knew what the book was about, I was still knocked sideways right along with Sam when she hears the news of the abduction on the TV. The chapters are headed Day 1, etc (the abduction actually happens on Day 2), and again Zarr does an amazing job of depicting the reactions of all involved. The older brother of the girl taken was particularly good, I thought. But despite the tension and the heartbreaking grief and anxiety everyone feels, somehow the book struck me as never using manipulative tricks to get the reader involved. Oh, Sara Zarr! I have been waiting all of my life for this book. This is the book I longed for when I searched the shelves of my local library; the one I could only dream of while perusing the big bookstore when we went to the city. You did it, although too late for the girl I used to be, the teens of today will find it. And love it. In her latest novel, ONCE WAS LOST, Zarr shows the truth of growing up as a child of faith – one immersed in the church. Although my father wasn’t a pastor like the father in the novel, other relatives of mine were and our lives revolved around our religion. What Zarr does – through the eyes of the main character, Samara Taylor – is deftly illustrate the way a church family can simultaneously feel like a cozy comforter and a smothering blanket. Samara has to pretend all is right in her world, even with her mother secretly stashed away in rehab and her father keeping other secrets. When a tragedy strikes at the heart of the youth group, Samara finds the fabric of their lives ripped open and exposed. It is appropriate that this book debuts during the Banned Books Week because there will surely be some short-sighted people who won’t see this book for what it truly is. It is not an attack against religion. ONCE WAS LOST is a beautifully written novel that accurately portrays the way a youth group is an extended family, the way the congregation treats their pastor, and the unconditional love that you can find. Although Samara, like most teens, has questions, the answers that she finds by novel’s end will lift your heart. More than once this novel brought me to tears with its revelations into Samara’s life and I wanted it to go on and on. ONCE WAS LOST shows struggle and redemption, forgiveness and transformation. Sara Zarr is a decidedly skilled writer who weaves themes of family, love, and faith throughout a novel that families should embrace and discuss. Thank you, Sara Zarr for writing this novel. This is life. This is truth. This is what faith looks like. ONCE WAS LOST on sale through Little, Brown and Company. Get a copy from an indie bookseller today! 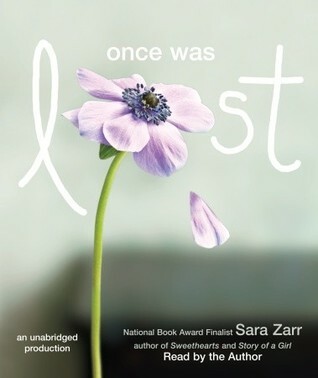 A perfect flower graces the cover of Sara Zarr’s Once Was Lost. Its soft pink petals top a long, graceful stem. One perfect petal drifts from an otherwise unmarred blossom like a tear falling to the ground. Blemished perfection symbolized as a lone teardrop perfectly represents Sam’s life. Samara, Sam to her family and friends, lives in a cushioned and beautiful world of her family’s creation. Her father’s a pastor, her mother’s a lovely woman, active in her church and liked by her peers. Yet, a darker side coexists within this dubious heaven. Fifteen-year old Sam’s secure life in small town Pineville shatters following two events. First, her mother’s DUI lands her in rehab for alcohol addiction. While Sam struggles with the pain of her mother’s illness and absence, she grapples with embarrassment when asked about when her mother will return; worse yet, she’s confused by father’s unwillingness to be forthright with his congregation about the reason for his wife’s absence. Sam’s appalled by what she perceives as an inappropriate relationship between her father and the attractive and lively youth minister, Erin. Hypocrisy rears its ugly head. Sam’s father has serious and undeserved trust issues when it comes to her friends and her activities. No dating. No internet. No freedom. Sam’s accepted her father’s dictates until she sees his personal hypocrisy. Do what I say like a mantra flows from her father’s lips. There’s no reason to doubt or mistrust Sam’s choices or her friends. There’s every reason for Sam to doubt and distrust her father’s choices and his friendship with Erin. Her father accepts meals consisting of his favorite dishes made by the youthful and attractive Erin. It feels wrong to Sam. To Sam her father’s stepping over the line that defines marriage. Worse, Erin’s doing her utmost to win Sam over. Then, in the midst of her family’s crisis, a thirteen-year old member of Sam’s church youth group disappears. One minute she’s with her family—the next, she’s gone. A second crisis in Sam’s life brings her faith in the goodness of an all-seeing, all-knowing God into question. The book’s title can be found in the opening lines from the hymn Amazing Grace. Sam’s experience differs widely, early in the book from the song’s words of promise. Sam grapples painfully with a newly found soul searching coupled with seeing hypocrisy in her father. She feels lost and blind to trusting in faith. It’s not difficult to live in a sacred bubble when nothing happens to cause doubt or questions. The bubble begins to wear when Sam’s religious faith and the reality of the harshness of life collide. Complex issues spin into the texture of Sam’s life. She loves and supports her mother’s commitment to find herself, which she lost in expectations from her husband and his church congregation. Sam loves her father but sees him stumbling into a faith-shattering fall from grace. She feels attracted to the missing girl’s brother, yet does not know how to deal with this new emotion. She fears for the missing teenager and cannot understand how a loving God could allow this to happen. How can there be a loving God watching over them when an innocent child might be in the grip of a dangerous kidnapper? Sam’s questions and doubts lead to jaded tears of doubt falling into her once-perfect life. Sam’s soul searching road toward a new found understanding is best summed up in lines from Amazing Grace. Sara Zarr’s gift of writing doesn’t come wrapped in a simplistic bow. Instead, Zarr’s writing comes packaged in the complexity of human experience. When all hope seems lost, it somehow rises up again. I did not come to the end of Once Was Lost feeling there is no grace or white dove with its promise of hope. Once Was Lost brings you along with Sam through her many dangers, toils and snares. It brings you with her on a journey of understanding, forgiveness and love. Samara Taylor is the daughter of popular, charismatic Pastor Charlie. Everyone loves Pastor Charlie, who always knows the right thing to say and always has time for everyone. Everyone except his family. Everyone except Sam, who is alone after her mother's quiet drinking problem resulted in a DUI which landed her in rehab. Sam, who is not even sure if she believes in the God she always took for granted anymore. And that's when tragedy strikes. A girl goes missing from their small town, and suddenl Samara Taylor is the daughter of popular, charismatic Pastor Charlie. Everyone loves Pastor Charlie, who always knows the right thing to say and always has time for everyone. Everyone except his family. Everyone except Sam, who is alone after her mother's quiet drinking problem resulted in a DUI which landed her in rehab. Sam, who is not even sure if she believes in the God she always took for granted anymore. And that's when tragedy strikes. A girl goes missing from their small town, and suddenly, nothing is the same. Things that Sam took for granted as safe suddenly seem threatening. And her father--and her faith--feel more distant than ever. Sara Zarr is a master at the quiet novel that grips your heart. Even in this book, where the plot revolves around a sensational story of a missing girl, the heart of the book is still Sam's very personal and very real struggle with her faith, her family and herself. The realistic portrait of a small town marred by tragedy--the way it changes everything, makes you mistrust things you once took for granted--it comes alive in this book. More importantly, while the central mystery never loses its hold on the reader, it also never overshadows the more interesting story--Samara's crisis of faith. It takes a very skilled writer to weave a novel that has room for both plotlines and lets the much quieter story be the more significant one. "Samara Taylor used to believe in miracles. She used to believe in a lot of things." That's what it said on the cover of the book. What they failed to mention however, was that Samara Taylor will spend the entire book whining about every aspect of her miserable existence. My God, I could not wait to finish this book. Sara Zarr is the most boring author (aside from Mary Balogh) I've ever read for. She is just boring. Boring. Boring. Boring. Her writing skill is mediocre at best, her characters dull "Samara Taylor used to believe in miracles. She used to believe in a lot of things." My God, I could not wait to finish this book. Sara Zarr is the most boring author (aside from Mary Balogh) I've ever read for. She is just boring. Boring. Boring. Boring. Her writing skill is mediocre at best, her characters dull and dreary, and her plot unstimulating and dry. Sam spends 217 pages complaining. She complains about her life. She complains about her friends. She complains about her dad. She complains about her mom. She complains about the dead plants. She complains about going places. She complains about food. She complains about time. She complains about school. She complains about her existence. She complains about her home. She complains about her friend's home. She complains about her age. She complains about her alarm clock. She complains about Erin. She complains about the weather. She complains about the disappearance of Jody. She complains about herself. She complains about church. She complains about her thoughts. She complains about the neighborhood. She complains about the people. She complains about God. I mean, at one point, I just really wanted to grab her, shake her hard and ask her to please - for the love of God - just STOP! It couldn't possibly get any worse than this story. The disappearance of Jody was written atrociously, with nothing clarified, nothing making sense. And those little snippets of news were weak, the characters, the suspects, the investigation were horrible. The way she suddenly showed up at the end in a "sort of limping jog" after vanishing for two weeks was the worst scene ever written. It's like Zarr suddenly realised, "oh wait! I need to give my readers a happy ending!" and just put a couple of sentences together about how Jody was suddenly found. No explanations. No build up. No climax. Nothing. And one minute Sam's mom isn't answering phone calls or taking messages. One minute she doesn't want to come home. And then the next minute she's doing well and is coming home and is even almost back to normal. And Erin and Sam's dad...really? You could see that coming miles away, it was that badly executed, and that predictable. You read this book and you feel nothing. For any of the characters. Nothing. This is a book about God, about imperfection, about life, about valuing oneself and one's home and family. It's a book about having faith and believing despite the evil that may surround us. And yet I sat there reading it and I felt nothing. It left me uninspired and hollow. It felt like Zarr just wanted to write a book about God and her thoughts on God, so she quickly strung together a few story lines to go with that. In fact, this, to me, felt like a short story that they later decided to extend into a full-blown novel. And it makes me angry. It makes me angry because this received raving reviews - reviews that made me go out searching for this author's books. And when I finally found them, I bought not one, but three of her books. And upon reading just one, I am hugely disappointed and put off from reading anything else written by her. If I had not actually bought "How to Save a Life" and "Story of a Girl", I would never pick up another book by Sara Zarr, no matter how good the reviews are. I've heard it said by many that authors shouldn't narrate their own work. I mostly believe this to be true. Sometimes it works-- as in the case of "The Graveyard Book" by Neil Gaiman-- but with this book, it doesn't. Zarr may understand the emotional intensity of her work, but she doesn't know how to convey that vocally. However, her only so-so reading didn't detract from enjoyment of the story at all. I've gone to church my whole life-- quite literally-- and I was extremely active in my youth group in jr.. high and high school. Many of scenes and moments at the church that Zarr describes rang very true to me. Sam's personal crisis of faith and struggle also rang true for me. I personally believe that every child who is raised in the church will go through a crisis of faith at some point. Some will be huge and horrible, and some will only be small and relatively painless. But I do believe that this crisis of faith is necessary for true faith to take root. By the end of the book I won't say that Sam has come to full belief, but I do think she's maybe a little more open than she may have been at the beginning. And that is one of the many things I think Zarr did well with this book-- faith is a journey, not a destination and we've gotten to see Sam at one stop along her journey. This was very realistic and well-done to me and I was really glad for it. I felt many of the characters and relationships were also very believable and believably done. This is a great book for those who've grown up in the church or just for those who are curious about faith. There are no easy answers, and Zarr doesn't attempt to give us any. I also liked how Sam's relationship with her father was portrayed. I did wish that she would have been more vocal about her feelings and maybe confronted him about his relationship with the youth pastor, since it did affect her and was her business to some respect. But I also understand that that was not Sam's personality. By the end of the book, Sam is at a better place. Maybe not fully healed, but definitely better. Her life will never be the same, but hopefully she's come through to the other side with open eyes and an open heart and a willingness to keep trying and questioning and discovering her faith. Poor Sam. She needed a hug throughout almost this entire book, and not the one-armed youth leader kind. She sufferes from knowing a lot of people but being close to very few. She's also dealing with the absence of her mother, and her mother's long-time alcohol abuse, all alone. Her dad doesn't want to talk about the situation, or at least he doesn't want to talk about it with Sam, and Sam can't talk to anyone else about it either, not even her best friend Vanessa, without hurting her father's re Poor Sam. She needed a hug throughout almost this entire book, and not the one-armed youth leader kind. She sufferes from knowing a lot of people but being close to very few. She's also dealing with the absence of her mother, and her mother's long-time alcohol abuse, all alone. Her dad doesn't want to talk about the situation, or at least he doesn't want to talk about it with Sam, and Sam can't talk to anyone else about it either, not even her best friend Vanessa, without hurting her father's reputation. They just keep telling people her mom is "sick" and not letting anyone in the house. Luckily for Pastor Charlie's image, no one wants to come over anyway since it's August and their air conditioner is broken. When Jody is kidnapped, Sam is clearly upset (she's mad at life, not heartless), but it does give her something besides her mother and crumbling family to focus all of her energy/super-power-strength-worrying-skills on. It's when the youth group is all gathered praying for Jody's safe return that Sam realizes that she doesn't know anymore if anyone's listening. How could a just and loving God let Jody be kidnapped? How could He let Sam flounder through her life feeling so abandoned and alone? Sam struggles through this by herself as well. A daughter who may have lost her faith could be more damaging to Pastor Charlie's reputation than a wife in rehab. But Sam's doubt isn't a rejection of God. She desperately wants to feel the closeness and comfort that her youth group friends feel, especially when she has such a lack of both in her day-to-day life. She just can't muster it, and so she feels isolated and wrong. Though Sam's situation would undoubtably be helped by talking to her church friends or youth leader, the fact that she doesn't feel she can go to them is ultimately realistic. Even if she had sought guidance, this is something so personal that she has to deal with it alone. And she does, with the search for Jody, a budding relationship with Nick, fights with Vanessa, and unreturned voicemails left for her mother all buzzing in the background. Though it is a heavy read, I highly recommend Once Was Lost, especially for regular youth group attendees. I didn't really connect with this book. At first it was interesting with Sam, the MC, questioning her faith, which I think a lot of people can relate to. But then the plot took an unexpected turn and I wasn't sure what to make of it. I guess it was kind of like a parable because the event is something that certainly tests people's limits. Sam was a frustrating character. She was too angry/sad in a way that I don't think really corresponded with her personal issues. Not that she didn't have stres I didn't really connect with this book. At first it was interesting with Sam, the MC, questioning her faith, which I think a lot of people can relate to. But then the plot took an unexpected turn and I wasn't sure what to make of it. I guess it was kind of like a parable because the event is something that certainly tests people's limits. Sam was a frustrating character. She was too angry/sad in a way that I don't think really corresponded with her personal issues. Not that she didn't have stress in her life, but there were some instances where I really thought she was overreacting. I thought the situation with Nick, the sort of love interest, came out of left field. I wasn't sure why he reached out to her so many times, especially since he was 18 and she was 15. Isn't that against the law? But I digress. This book is about a girl who's father has always been a pastor and everyone has always viewed her as her father's daughter the god girl. Only thing is her mother has always been a secret alcoholic and made her doubt there is a god in any fashion. Now her mother is staying at New Beginnings a rehab facility and her father doesn't want to give her the time of day. A local girl goes missing and Sam starts to connect with her older brother. Only thing is he's a suspect and shes forbidden to be alon This book is about a girl who's father has always been a pastor and everyone has always viewed her as her father's daughter the god girl. Only thing is her mother has always been a secret alcoholic and made her doubt there is a god in any fashion. Now her mother is staying at New Beginnings a rehab facility and her father doesn't want to give her the time of day. A local girl goes missing and Sam starts to connect with her older brother. Only thing is he's a suspect and shes forbidden to be alone with him. This review has been hidden because it contains spoilers. To view it, click here. Three point five stars. I liked it a lot but I didn't feel it was up to the level of Zarr's last two books. Sam's turn back to faith came too quickly and easily and appropriately-timed to me. I wanted more from the Erin story. I wanted more Vanessa/Daniel drama. I guess I wanted more from a lot of this. It's a slim little volume and I think it could have used more, more, more. That said: her prose is lovely, as always. Loved all the red herrings. Loved the constant feeling of suspicion and dread. Three point five stars. Sara Zarr has a real gift for getting into the heart of a teenager. Her characters are so unbelievably real, that you simply cannot put the book down until you know what's happened to them. This book was no exception, in fact, it's my favorite of hers so far. A beautiful book about faith and family and life. I cannot recommend it highly enough. In some ways, reading Once Was Lost was like flipping through my old diary. Though our circumstances were entirely different, the universal themes rang true. I couldn't help but reflect on what I'd do if I were in Sam's shoes and I completely related to her doubts and fears. Compelling read. This was a pleasant surprise as it's not a book that I would normally read. Zarr's writing is pitch perfect and she weaves completely believable plots and characters. The violence that occured in the story did not happen before it began. As a young girls life seemed to be falling apart in her home/family life things ended up getting worse for her when a girl she knew in her home town was kidnapped. Throughout the book many people were suspects in the disappearance of the young girl but was seeming impossible to find the one responsible for the kidnapping. When the reader discovers who is responsible it’s more unexpected than anything else. As the reader reads further in the book the details of certain people make them think that they could be the kidnapper until the end when the suspect is found. The narrator in the story would be the detective in the story but doesn't know more than the reader, everything the narrator feels or thinks is explained in the book. The reader follows along the whole time and is always on the same page. This story did keep the reader interested and curious throughout the book because along with the missing girl there were also other problems such as the girls mother in rehab, her dad was always ‘busy’ with a girl from church and much more that always kept the reader wondering what will happen next or if the readers suspicions were true or not. I would recommend this book to anyone that enjoys reading books about faith and good endings. I would not recommend this book to someone who likes mystery with a brutal story line. This was an okay-ish book that dealt with the daughter of a preacher who is losing her faith as her world starts to unravel. Her mum is in rehab and her preacher dad may or may not be having an affair. I thought this was a decent enough read, but the plot was a bit weavy and floaty and didn't really go anywhere quickly, but the characters weren't strong enough to make this a character-driven read either. Meh. I was going to rate it five stars, but I wanted more at the end. It felt a bit rushed after the heavy drama that preceded it.